I had often thought about this church. 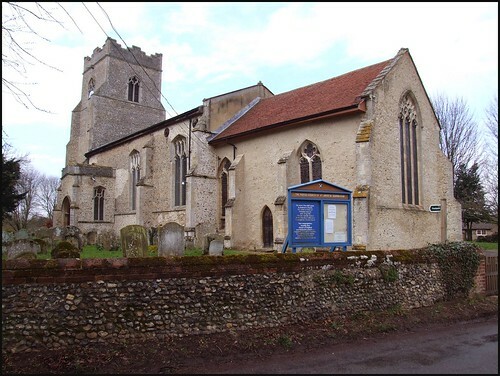 Back in 1998, it had been one of the first churches in Suffolk which I had explored for this site, and I knew I had not done it justice. I remembered that it had been fascinating, a treasure trove of details. Reading about it, I wondered what I had missed. Barningham is a bit off the beaten track, but villages like that tend to have a life of their own. Coming back to north Suffolk in early 2008, I found new houses built around the fringes of the village, but it still had the feel of a place where people actually lived, and didn't just commute from. As I took photographs of the outside, A smiling, bearded man came out of a driveway and disappeared towards the centre of the village. I thought I recognised him, and then I remembered that he had given me the key ten years before. Well, there was nothing to be done. I thought I may as well finish the outside, as it was such a lovely day, and it might be raining if I ever came back. But then he was back, and so I went and knocked on the door of the pretty little thatched cottage beside the church. His name is Michael Lingwood, and he wrote the guidebook for Barningham church. I still think it is the best church guidebook I have ever read, anywhere. He was just as cheery as I'd remembered, too. The tower is dated accurately from a bequest 1439, and you step from the south porch into a fine perpendicular interior. The great windows obviate the need for a clerestory. The most famous feature of St Andrew is its fine collection of medieval bench ends. They are similar to those at Woolpit and Tostock, and so perhaps are not part of the same group as those at neighbouring Ixworth Thorpe and Honington. Most of them are animals, although there are also mythical creatures, and one joke at the xpense of the clerisy, a pig in the pulpit. Memorable are the camel and the disabled man. As the guide observes, whoever carved the camel can never have seen one - they gave it cloven hooves. Something yo won't see anywhere else in East Anglia is is the painted wooden board to the west of the south door. It says "Flagellatus est IHC sancta trinitas unus deus. Sepultus IHC". These words are from the Catholic liturgy for Holy Saturday, and Mortlock argues that this is part of a movable Easter Sepulchre. This would make it a unique survival. Not quite as unusual. but just as interesting, are the 17th century gates in the rood screen. The rood screen itself is 15th century. But a mystery attaches to these gates. At some time after the Reformation, the chancel step was lowered. It was not raised again until the mid-19th century restoration. Why, then, are the gates able to accomodate the step? Were they installed here from elsewhere? Probably, the gates are Laudian, from the 1630s, and the step was not lowered until the Puritan reaction of the 1640s, when such things as raised chancels were seen to be popish and superstitious. I tis unusual to see rood-gates in Suffolk, which can only be found in about half a dozen churches. Only those at Cowlinge are earlier. Like so much here, they have a character of their own. The screen itself is fine. Cautley reports figures on the dado, but there are none there now, and I can only presume that the late 1930s restoration Mortlock reports did away with them. The roodloft stairs climb attractively up through the window embrasure, as at Whepstead, and you can see how the wooden part of the system would have integrated with this. Beside it is a lovely piscina, which would have served an altar in this corner. A brass for the priest William Goche, who died in 1499, shows him as a rather portly, amiable fellow. He looks well suited to this church, of which he was Rector, especially on such a bright spring day as this, the nave flooded with light, the spirits lifted.